What if heaven existed on earth ? The Chapelle would surely be its cellar ! In the old days it was called Grande Chapelle or Haute Chapelle. One of the little Gevrey vintages, it is also one of the greatest in complexity and refinement. Its history is marked by devotion. 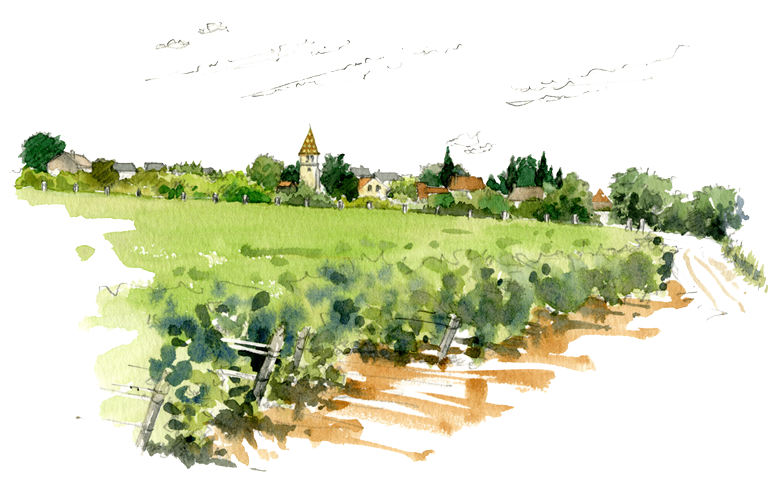 Just a stone’s throw away from the Bèze vineyard, in the past, a small chapel was situated. Built in 1155 and placed under the invocation of Notre-Dame, it fell into disuse in the XIV century. The winemakers expressed great sorrow, and this chapel was then rebuilt and consecrated again, on the 4th July 1457. The pious assembled around ishop Philibert de Beaujeu offered up the fruits of their labour to heaven. Work, perseverance, courage are what our grandfather Louis must have had. But he needed a lot extra than that, in order to acquire this beautiful parcel of Chapelle land. This extra is called friendship. Around 1890, our grandfather, who came from Chambolle-Musigny, met up with Mr Truchetet. This fan of mechanics, this ingenious handyman, had then perfected an injector to stifle the phylloxera using carbon sulphide. At this time, phylloxera was rampant in Burgundy. The struggle began. soils. From this warm, shallow, well-drained soil, composed of fine clays and blocks of limestone below, fine, rich and expressive wines are born. This Chapelle, it’s like baby Jesus going down the gullet in velvet breeches !